this show is always so quick! i got to spend the night with my spinning guru friend lauren, her husband, and their baby (the original baby belle by the way! )… and came home with this beauty. as for the show, it is always well organized and fun. my two handspun shelves went from full to a rather pathetic 8 skeins over the 5 hours. i got to meet all sorts of fabulous fibery folks, but was especially happy to finally shake real hands with sarah and lolly. i also loved seeing those who bought from me last year and hearing stories of what they did with the handspun they bought. i’m excited to see all the striping knitting out there – since subtle stripes and shifting stripes were most of what i had. yay stripes! 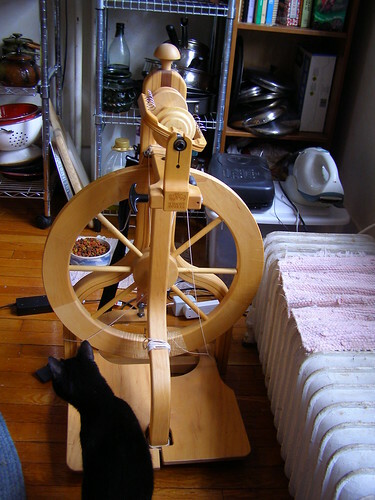 This entry was posted in community, cosyknitsliterally, cosyspins, craftfairs, handspun, spinning by cosymakes. Bookmark the permalink. Wow, Cosy. Your new wheel looks so smooth and golden. I was so happy to meet you, Cosy – and to help clear out your handspun shelf a bit too :) looking forward to hanging out again in the future. lovely wheel! yeah!!!! :) you will LOVE her! she is a wonderful wheel! and you know she was well cared for by her prior mommy!